Oats, Spinach and Carrots are beneficial for diabetic person as they are lower in carbohydrates and have anti-inflammatory, anti-cancer and blood-pressure-lowering properties as well as many other positive health effects. Roast dry oats and rava in a pan for 2-3 minutes. Let it cool. Soak rava and oats in curd. Add water as per the need to make thick batter. Leave it for 10 minutes. Add salt, ginger, green chillies, baking soda and mix it well. Add spinach and carrots and mix it well. Check the consistency of the batter, it should be dropping but thick. Add water if there is a need. 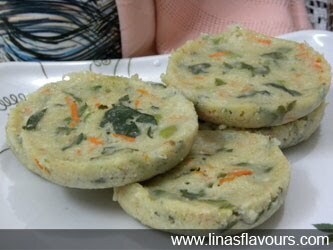 Grease idli stand with oil and pour batter. Steam cook for 10-12 minutes. Serve it hot with green chutney or tomato ketchup.